Hey guys! We did some adding and subtracting in the yard over the weekend. We added a new tree and removed an old concrete column that was located at the base of our back stairs. I had the luxury of having a broken hand and wrist, so I couldn’t help out (it killed me). 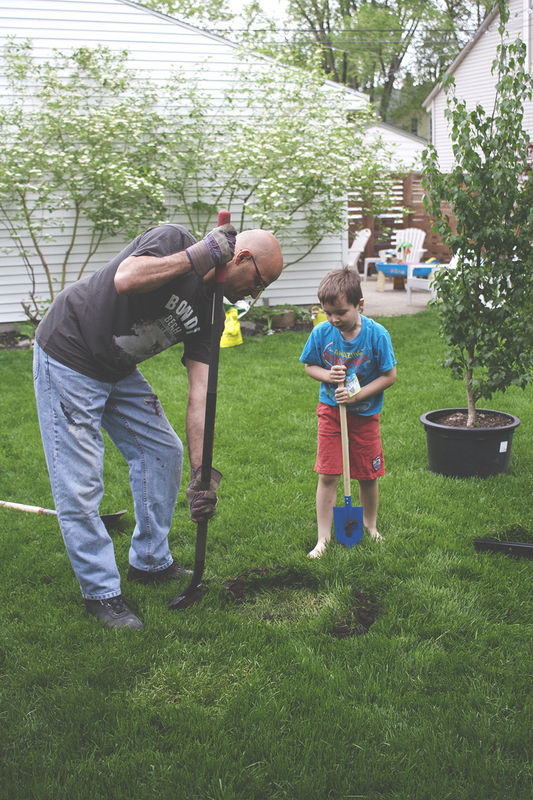 My kid, my neighbor and my husband jumped in to plant a new tree in our backyard – aren’t they some good dudes, er what? Why do we need a new tree? Simple, to create more privacy. We have a rental on the side of our house and ever since my aging crust-punk-neighbor (renter) declared me his “enemy ’till death,” in front of my mom and my 5-year-old-kid one sunny afternoon, I’ve been determined to create as much distance between that house and mine as I can. 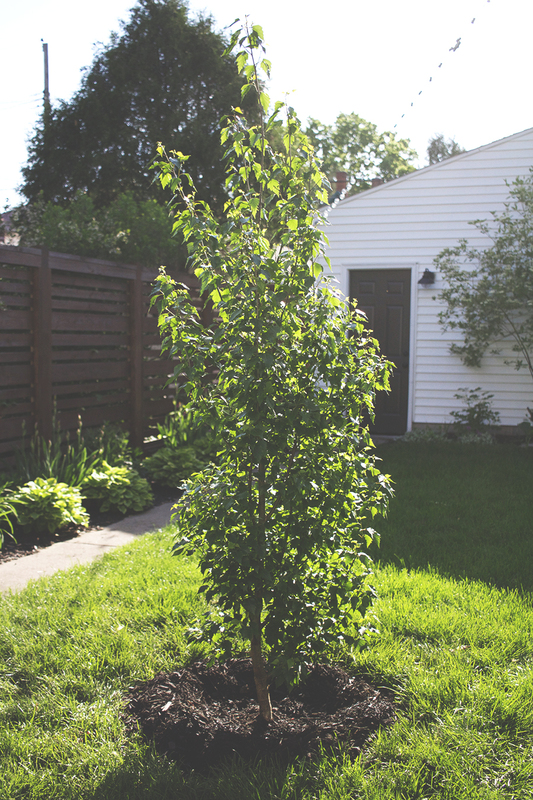 This Dakota Pinnacle Birch will stand tall at 30′, is nice and dense with leaves, and spans the width of 8′. The tree is the perfect size to block out the perched view my neighbor has of our back yard from his second floor deck, while at the same time being architectural in shape as to limit our entire backyard from becoming too shaded. Most of you probably don’t have the luck of having a completely terrible neighbor so planting a tree for this specific reason probably isn’t an issue you for you. 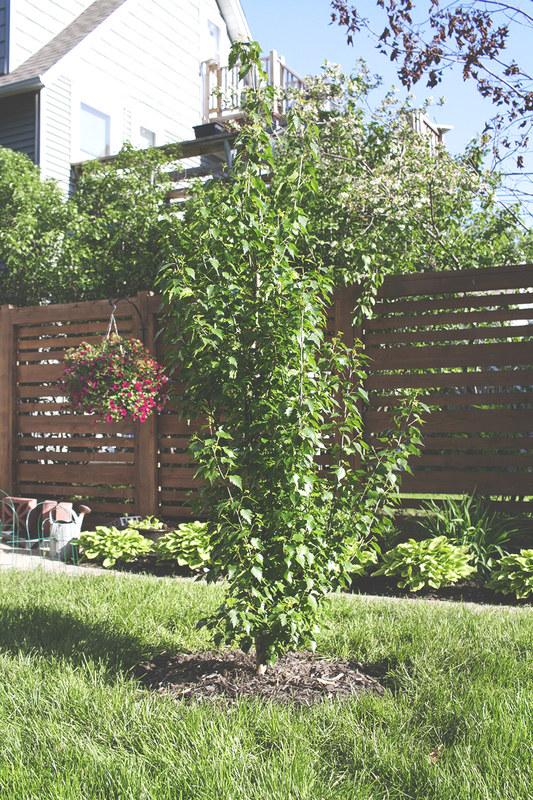 However, I have smartly written this post so even if you’re adding a shade tree to a sunny yard or an ornamental tree to a garden bed, the same rules apply. Choose a location, make sure it will not get in the way of foot traffic, isn’t too close to walkways or structures and isn’t planted under power lines. Call before you dig! Make sure you know where your utility lines run under your yard. Most cities have a number you can call, in Minneapolis it’s 811. Remove loose soil from the top of root ball. Often times trees from garden centers come packed with extra soil. It is important that the trees trunk is not covered and the soil only comes up far enough to cover the roots only. Measure the width of the root ball and make a hole 2-3 times as wide and equally as deep. It is important not to dig deeper than the depth of the rootball as you don’t want to backfill and have soil cover the trunk of the tree. 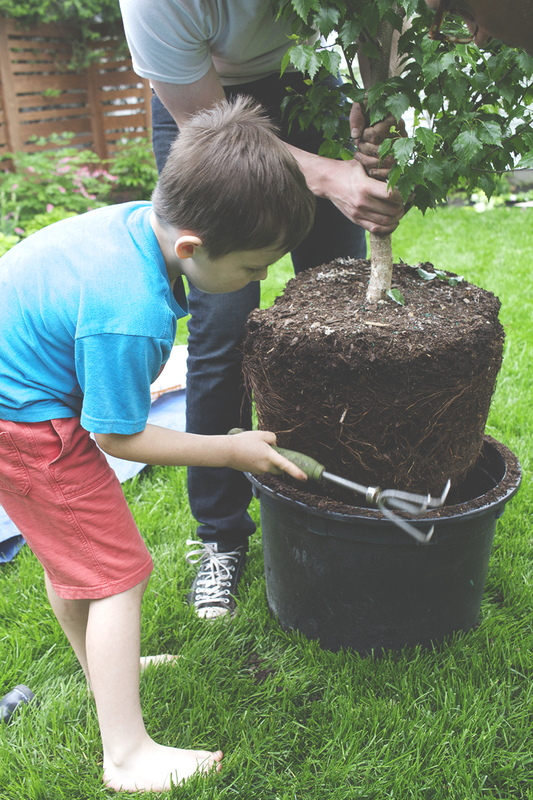 With a garden spade or shovel remove the grass and roots from top of the tree bed. 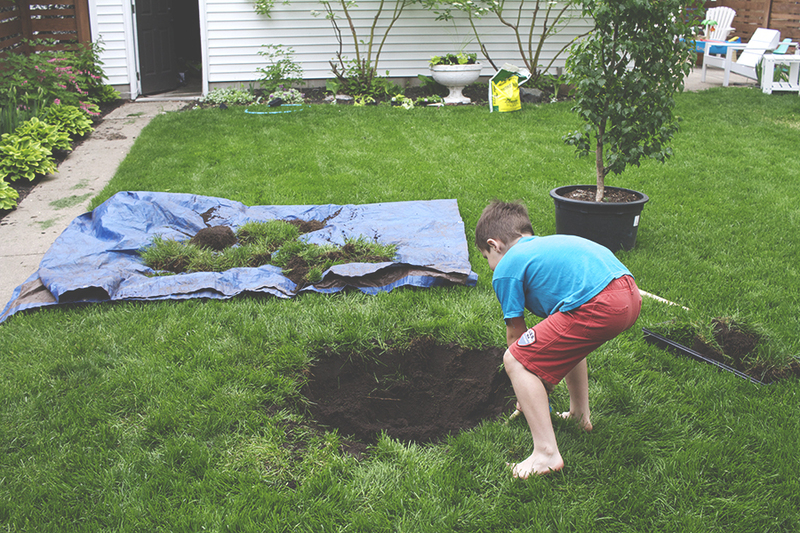 Use a tarp to protect the lawn and collect the grass. Use a wheelbarrow to collect the soil. If you have bare spots in your lawn re-use the sod to fill in sparse areas of lawn. Remove tree for pot or burlap. Remove tree for pot or burlap, take care to pull it up directly from the pot making sure not to damage the branches. If the tree is rather large tip the tree on it’s side to slide the pot off or remove burlap. Pulling the tree near the base of the trunk usually works best. Use a cultivator or gardening trowel to loosen the roots around the root ball. The tree roots have been compacted into their pot and need to be loosened up so they can spread out and take root in the new tree bed. 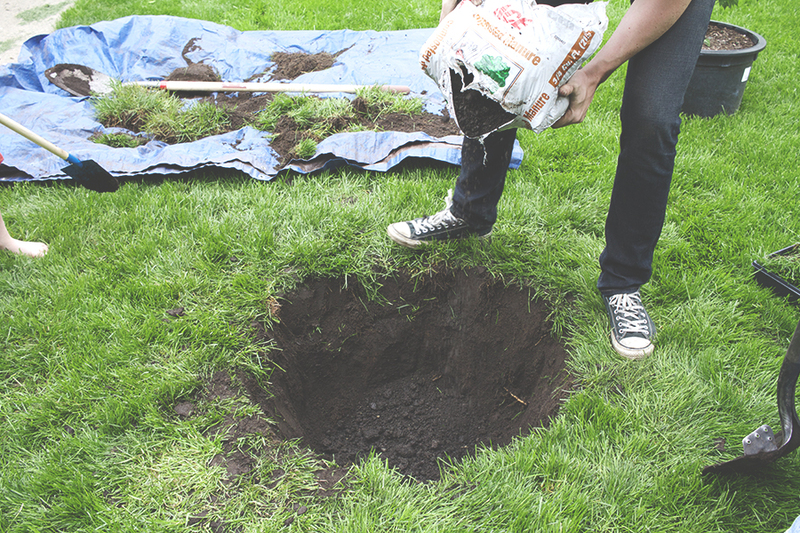 Add compost or fertilizer to the bottom of your hole. 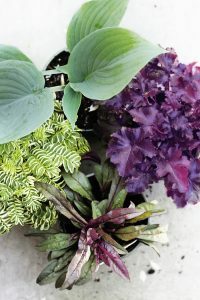 I always add a bag of compost but if you are considering amending the soil with fertilizer, make sure to ask a nursery professional what kind of fertilizer to use and how much. Center the tree in the hole and and rotate it so you have it facing pretty side out (every tree has a good side). I pointed the less pretty side towards the jerky neighbors house. Make dirt tree soup – that’s what Finn calls it. 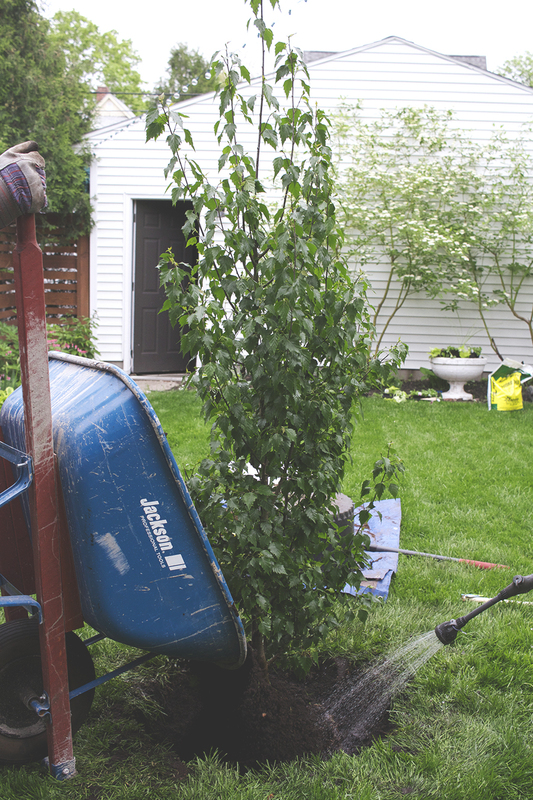 Water that hole deeply, plunge in the hose and fill it up to the top with water before backfilling with soil. 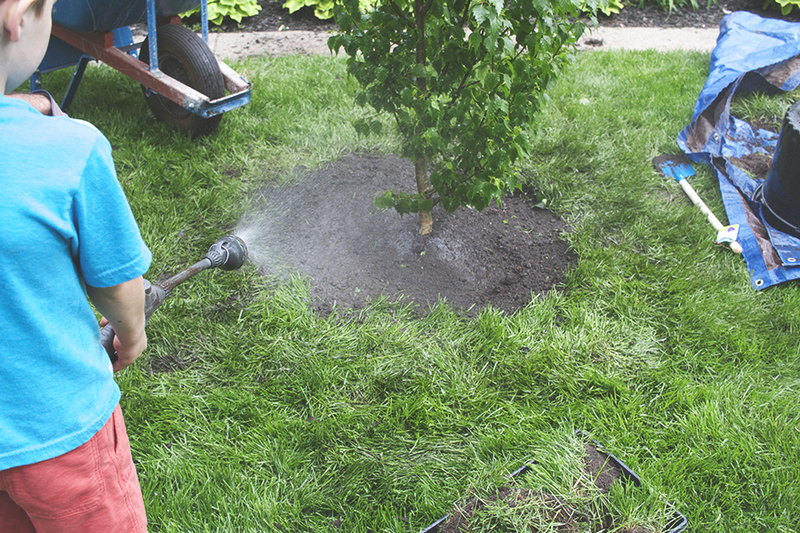 Mulch the bed of the tree – be generous and cover in a good 3″ of mulch. Take care not to mulch near the base of the tree. Around the garden edge pile the mulch up so that it creates a bowl, this will help the bed retain water for the tree. Water, water, water. Rule of thumb. Water everyday the first week, twice a week the second, and at least once a week until the frost. Becky! Yes, it’s true – privacy is even needed from good neighbors, and fences are needed for good neighbors with big dogs. Back porches were made for private drinking (especially in the afternoon)! Oh man, you have to tell us the story of how he declared you to be an “enemy till death”! Unless he just walked out and said it with no context. But I feel for you wrt bad neighbors, we had the crazy people on the block on one side, and the other side had a kid who assulted and attempted to rob another neighbor at knifepoint and stole stuff from my yard. The crazy people called the sheriff’s department on us all. the. time. (“they swept grass into the street!” “people at their house parked cars in front of our house!”) and also called the homeowner’s association as well (“their grass seems high” “their vicious attack dog went after me!” – that was my 10lb 7week old puppy, btw). I had trees removed because they leaned towards their house and was terrified of the hell I’d go through if one actually fell over. Crazy people! Oh man! Bad neighbors are the absolute worst. I swear, houses should have to come with a neighborhood meet and greet before you agree to buy them. This guy is seriously psycho – on this particular day, Finn was playing in the pool and as kids do he was screaming and laughing when would jumping into the ice cold pool water. Our neighbor guy found the sound of kids annoying on the first 80º day of the summer, so he decided to take a stereo and blare it at us on full volume from his deck perch. After asking him to turn it down (which he refused to do) I called the cops on him. That’s when he declared our eneimieship till the death! Hey, great job with your tree! Sorry about your jerky neighbors, but at least you get a cute tree out of it. Hopefully it’ll be around a lot longer than that neighbor. Out in Oregon we have this organization called Friends of Trees, which will plant a tree in your yard for you for very little money, preferably on the parking strip but also elsewhere. This spring we got a tree planted by them, and are volunteering to be tree inspectors, to educate the new tree-owners about what young trees need to give them the best chance of survival. After my three-hour training session with arborists, I feel like I know a thing or two about nurturing a young tree. They actually don’t recommend fertilizer at all during the first few years of a tree’s life, since it can cause problems. Compost is good, though! We have a whole list of things to check, but the ones people can control are weeds, mulch, and water. Your advice about mulch is right on–they gave us an easy way to remember it, which is the 3-3-3 rule. 3 inches deep, 3 inches from the base of the tree, and 3 feet around. I’m not sure what summers are like where you are, but out here that’s when the rain stops. That’s when trees are doing most of their growing, and need lots of water, though. 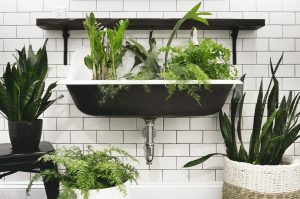 They need 10-15 gallons of water a week, and it’s nearly impossible to over-water them. But slow, deep watering is best, so they develop deep roots. An easy way to accomplish this is to grab a big cheap hardware store bucket, and drill a couple of small holes in the bottom. Fill it up over the base of the tree, and let the water ooze out slowly. I absolutely love birch trees – all kinds. Once my grandma told me that no yard was complete without a birch tree. I am still searching for the perfect spot in my own yard for one. Kudos to you! Awh, that’s such a sweet sentiment. I love that idea, and I love birch trees too. I am noticing them everywhere now that I have one. Thanks Splash! I’m sure the birch tree will be a great addition to the backyard even if it doesn’t solve the problem with the neighbors. We’ll also be able to see it from our upstairs porch once it gets biggre. Good luck with your neighbors – they can’t stay forever, right? Makes me wish I weren’t allergic to birch trees! They are my favorite tree in the summer (maples win in the fall). Oh no, what a diss. I love maples too – our street is lined with them, so pretty with their yellow leaves in the fall. I feel your pain – I am in Mpls as well, literally the first time we had friends over to our brand new house for a drink on the back patio, our 60ish neighbor trudged over, parked himself on a stool (that he brought) and did not leave until we went inside and basically closed the door in his face. Granted we were trying to be polite, but damn! And on top of it, he did not carry on normal conversations with us, he was super rude, interrupting everyone, talked in pig latin and sang songs that didn’t make any sense. I seriously thought the hidden cameras were going to come out at any second like just kidding, there’s no way your new neighbor is THAT BAD!! We built a 6 foot privacy fence before winter hit that year haha. Hi! 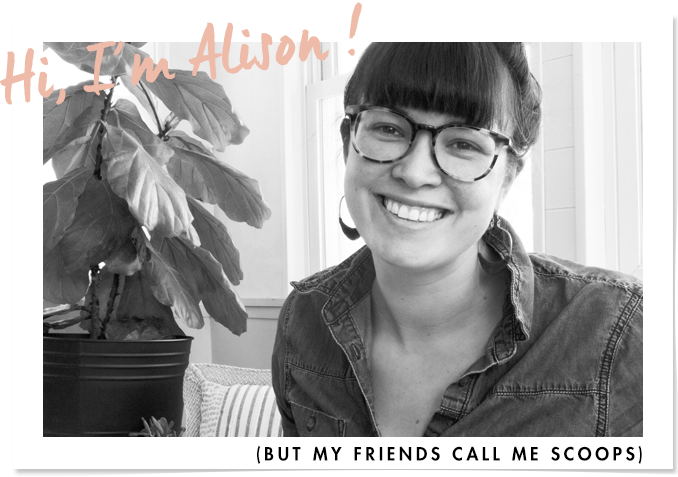 So I stumbled upon our blog, and loved the look and then realized you’re also a Minneapolis gal! 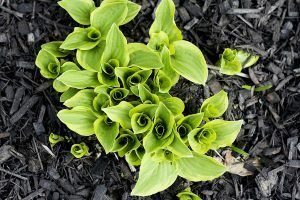 We just bought our first house this past fall, and I’m trying to be patient and see what is already growing here. I’m a transplant (no pun intended) from California and this is our first time with our very own yard. Do you have any posts on being patient with your garden? ha. Also, what is growing along your garage there with the white blooms? They look lovely. 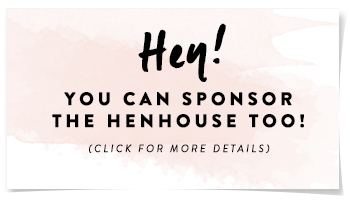 Older Post Introducing the HenHouse App!